In Legends of Amun Ra The Emerald Tablet, Leoros is the 13-year-old son of an archaeologist and scientist; he is sick of being dragged around the globe by his mother. Before he has a chance to make a friend or a connection with anyone, they’re off again to another country. 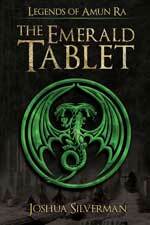 While in Egypt, Leoros’s mother finds an Emerald Tablet that helps to transport Leoros to another world. A world that he’ll someday be expected to save. But sometimes evil can be as alluring as good. I must first apologize to this author. Through my own disorganization, I missed the date on which I told him that I would review his novel—and then took longer to review than anticipated. Legends of Amun Ra The Emerald Tablet was a great book and it was my loss to have missed the original review date. The first scene of this novel involves a father brutally choking his 6-year-old daughter and asking her if she felt hate. I read the scene and just sat there shocked for a few minutes, and then realized what a brilliant scene it was. In those few pages, Silverman shows what we’re up against in this very complex and involved story. This man is going to do anything he has to do in the name of developing the powers of this little girl. Conversely, we have an image of what this girl is going to grow up to be, and in that moment, those two characters are laid out like crystal. After this scene, the next 10% or so dragged because what Silverman has given us is a very complex story and elaborate new world. Silverman lays out the rules and setting for us in graphic detail as succinctly as can be done. There are a number of characters in this novel and, to Silverman’s credit, they’re all unique and distinct. Atlantia is a slave girl with special powers who is maybe too smart for her own good. Pythos is a mentor who maybe realizes that he’s a bit beyond. Legends of Amun Ra The Emerald Tablet is science fiction, fantasy and history rolled into one. Silverman’s use of mythology is broad and (from what little I know of Egyptian and Greek mythology) seems to be proficient. Legends of Amun Ra The Emerald Tablet is a good old-fashioned battle between good and evil, and especially once the action really got going toward the latter half of the book, I could not put this book down. Every time I thought the plot would twist, it turned. I’m just going to admit it, I cried at the end. I won’t give it away but I did. A few pitfalls give away that Silverman is a first-time author. The characters think more than do, but even when the story dragged, the action of the apprentices battling was so vivid that I know as Silverman releases future books, he’ll be a ratings smash. Legends of Amun Ra The Emerald Tablet is for anyone who likes really complex story lines and unique stories with a great spirit of adventure. Read the review of the first book in the series The Soul of the World: Legends of Amun Ra – 2.